Bart Marantz was Director of Jazz Studies at the Booker T. Washington Bart Marantz High School for the Performing and Visual Arts; formally the Arts Magnet High School from 1983 to 2015. Mr. Marantz did his undergraduate work at Indiana University, Blooming and the University of Miami, (Florida) where he received his BM degree in Instrumental Jazz Studies/Performance under the direction of jazz educators Jamey Aebersold, David Baker, Jerry Coker and Dan Haerle. He received his masters degree in Afro-American Jazz Music Performance at the New England Conservatory of Music in Boston (Massachusetts). While at N.E.C. he performed under and studied with Phil Wilson, Jaki Byard and George Russell. As the graduate assistant to the jazz studies department he taught courses in jazz analysis, jazz improvisation and jazz keyboard harmony. Before coming to Texas, Bart taught at Jones County Junior College, 1978-1980, in Ellisville Mississippi, and was Director of Instrumental Music at Lake Sumter Community College, 1980-1983, in Leesburg Florida. Bart Marantz has toured and played with a variety of shows including Ray Charles, The Glenn Miller Orchestra, staff band at the El Casino in Freeport Grand Bahamas, Nancy Wilson, Frankie Valley and the Four Seasons, Gladys Night and the Pips, The Apollo Stompers, Jackie Byard. conductor, The “Up-Town Dues Band,” Phil Wilson Director and for Norwegian Caribbean Cruise lines as part of the house bands on, the MS Boheme and the MS. Skyward. Bart has written for a number of periodicals that include a weekly column for the Hattiesburg American Newspaper and hosted a radio show on WMSU-AM, both titled The Jazz Corner. 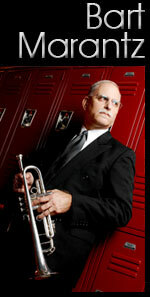 He has published in The Florida Music Director, The Music Educators Journal, The Community and Junior College Journal, The Jazz Educators Journal, Down Beat, The Texas Southwestern Musician, Selmer Brass Notes, InTune, JazzTimes, JazzEd, and The Band Directors Guide Magazines. He is co-author of a method book with tape called Jazz Figure Reading Studies forwarded and edited by Jerry and Patty Coker, published by Columbia Studio P.R./C.P.P. Belwin, Inc. Mr. Marantz was selected as one of fifteen (15) trumpet artists to be part of the book, Selected Trumpet Master Classes produced by Wind/Player Magazine, and the Conn Selmer Company. In January of 1997 MENC and IAJE released the book Jazz A Course of Study of which Mr. Marantz is a contributing author. Bart is a contributing author for the newly released book, The Jazz Ensemble Companion, published by MENC/Rowman & Littlefield Education Publishers, Inc. In 2014 The Jazzer’s Cookbook, a collection of creative recipes for players and teachers was published by Meredith Music publications and Hal Leonard, Bart is a contributor to this publication. He was an IAJE “Jazz Educators Journal” staff reviewer from 1989-2008 writing well over 150 articles to date on jazz and jazz eduction. As a clinician he has appeared at the Valdosta State Jazz Festival, the Southern States Jazz Festival (Florida State University), the Northern Colorado University Jazz Festival (Greely Colorado), Texas Tech University, The University of Texas at Austin, A&I University, Louisiana Tech University, the Greater Southwest Music Festival, the Brandon Jazz Festival (Brandon Canada), Musicfest Canada and the International Association of Jazz Educators Conference, The Texas Music Educators Conference, The Tennessee Band Directors Conference, The Jazz Educators Network Conference, The Stanford Residency and the Brubeck institute to name a few. During the summer of 1986 Bart was selected as one of ten Fulbright Scholars in the US. and taught Jazz Studies in South Africa, where he spent thirty days. He appeared in Johannesburg, Pretoria, Bononi and Durban. While in Durban, Bart held clinics at the University of Natal where he lectured and played with Darius Brubeck, son of jazz legend Dave Brubeck. In July of 1989 Mr. Marantz was selected as one of ten directors in the US. and Canada to visit the Montreux Jazz Festival in Switzerland through IAJE. As a result the BTWHSPVA jazz program has an open invitation to Montreux by the Swiss Visitors Bureau to perform at the prestigious European jazz event. During his tenure at Booker T. Washington High School for the performing and Visual Arts, the music program won "245" DownBeat Student Music Magazine awards (1983-2015). 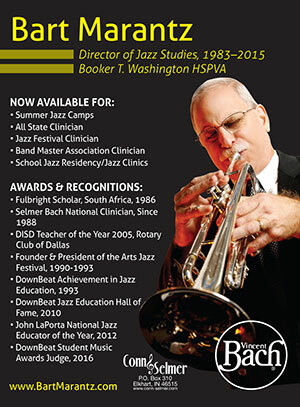 During the years 1984 and 1989, the jazz program at Booker T. Washington led this international competition in the US. and Canada winning more awards than any other high school or college in North America and repeated this amazing feat again in 1992 and again 1996 through 2008, 2009 and again in 2010! The jazz studies program has produced 17 albums during the past 32 years under Bart's direction for a total of 24 jazz recordings over the school's history opening in 1979. These recordings have been favorably reviewed in Cadence, JAZZIZ, JazzTimes and Down Beat Magazines and have had air play throughout North America and Europe. During this period twelve (12) Booker T. Washington musicians have been signed to major labels as leaders. They are Roy Hargrove (trumpet), Verve Records, Tim Owens (vocal) Atlantic, and Eric White (drums) Reprise, Erika Badu (vocal) Motown Records, Aaron Comes (drums) Epic Records, Frank LoCrasto (piano) Max Jazz, Luke Marantz (piano), Red Piano Records and Steeplechase Records, and Norah Jones (vocal-piano), Blue Note Records, Frec Sanders (piano), Leaning House Records, Shawn Martin (piano), FOYOSOUL Recordings, Sam Harris (piano), Blue Note Records, and Robert "Sput" Searight (drums) Impulse records. Mr. Marantz has been a Selmer Clinician since 1988. He plays Bach/Selmer trumpets and flugal horns exclusively. He was the featured artist in the national Selmer magazine "Brass Notes" in the 1991 spring, again in 1995 winter issue and gain in the fall '96 issue. Most recently Bart was front page news on the "Center Stage" Conn/Selmer Web page 2010 and front page of the Dallas Morning New in June of 2010 for his ” Jazz Eductor Hall of Fame honor from “DownBeat Magazine. Bart's original music and arrangements for combo and big band are produced and available through Northern Colorado Press, Greely Colorado. Bart Marantz was visiting Professor of Jazz Studies at Dallas Baptist University from 1986 to 1990, where he taught jazz improvisation and conducted the jazz ensembles. He also works as contractor/musician serving the Dallas/Fort Worth Metroplex. Bart was the US. Curriculum Chairman for the International Association of Jazz Educators from 1990-2001. In December 1991 he was selected to run for the IAJE Board as US. Representative. Since 1983 Mr. Marantz's jazz ensembles have appeared at the annual IAJE Conference seventeen (17) times performing big band, combo, and vocal jazz music. Mr. Marantz was selected as one of four (4) finalists to interview for Executive Director of IAJE in 1994. Bart Marantz was founder and President of the Arts Magnet/Arts District Jazz Festival for scholarships. This 501 (C) (3) was a non profit organization dedicated to distributing cash scholarship awards to outstanding young talent to help further their music education. It served those students in attendance as well as the general public with clinics and concerts of the highest quality during the three day event. The festival ran from 1990 to 1993 in the Arts District of down town Dallas. During the summer of 1991 Mr. Marantz did a video shoot for the TV commercial "The Power To Teach" in New York City. This came as a result of being selected as one of seventy teachers in the US. to be included in the book "I Am A Teacher," written by David Marshall Marquis and Robin Sachs published by Simon and Shuster. 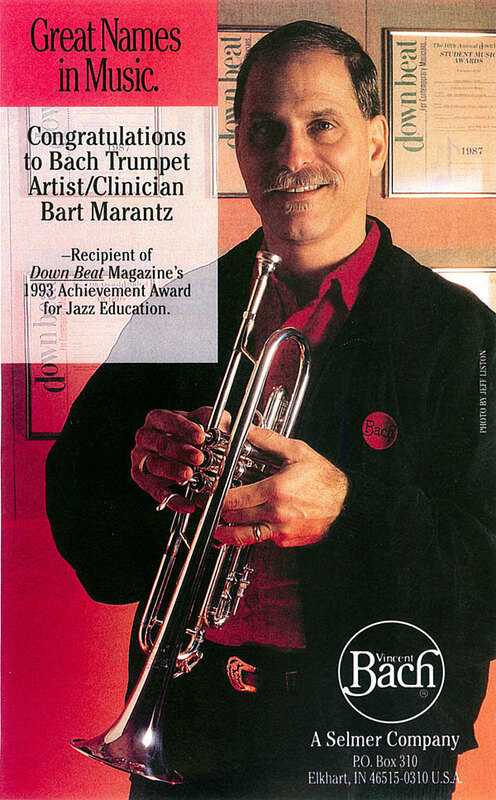 Bart Marantz was labeled "One of the countries most successful music teachers" by D Magazine in July of 1989. As a result he has been inducted into the 1992 "Who's Who In American Teaching," published by the National Reference Institute, the 1993 "Who's Who In American Education" published by Marquis Inc. and the 1994 edition of Men Of Achievement, published by the International Biographical Center, Cambridge England. The National Honor Roll's Outstanding American Teacher for 2006. In April 1993 Bart Marantz was given the "International Achievement Award In Jazz Education" by Down Beat Magazine. Bart was awarded The Dallas Rotary Club "Service Above Self " for the Dallas Independent School System for 2005. Bart Marantz was named as the 18th recipient of the international "DownBeat Jazz Education Hall of Fame" for 2010. 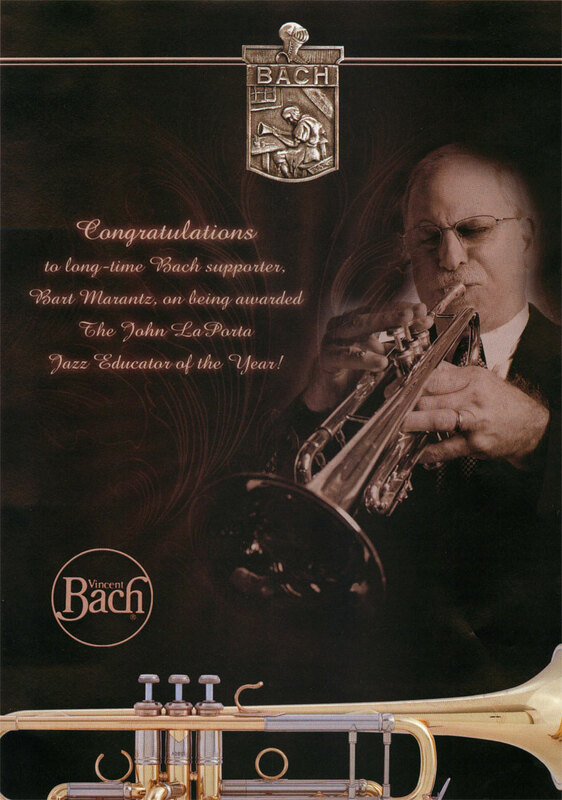 Bart was awarded “The John LaPorta National Jazz Educator of The Year” for 2012 by The Berklee College of Music, Boston and the Jazz Educators Network, JEN. Bart Marantz is the 9th recipient of this prestigious national recognition. 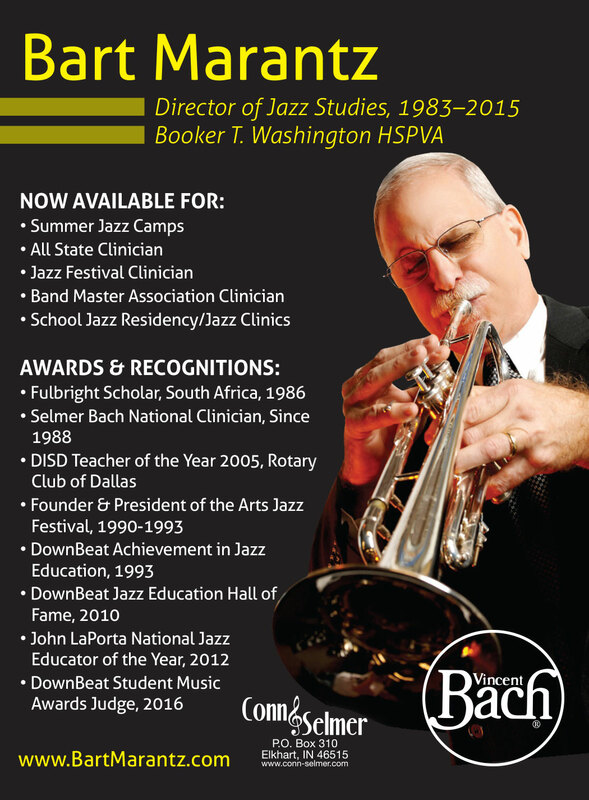 Most recently, The Dallas Sammons Center for the Arts awarded Bart as the Dallas Metroplex Jazz Educator of the year for 2015. In January of 1995 Mr. Marantz toured Russia performing eight (8) concerts with a "pro" quintet and teaching in Samara, Saratov, and Moscow. He premiered, from his family suite, "Ballad For Mom," performed by the Samara Symphony on national Russian television as well as taught and performed at the Moscow Institute for Fine Art, the Music Saratov Conservatory. Bart Marantz was named "Executive Director" of Jazzfest USA in July of 1996 by Down Beat Magazine. He was the cover feature article for the national periodical JazzEd Magazine with an article entitled, "Anything Is Possible" in the November 2008 issue. Bart taught for 15 years as summer faculty at the University of Texas at Arlington teaching jazz studies. He was named as visiting guest artist at the "Brubeck Institute," Summer Jazz Colony, in Stockton CA from 2000 to 2011and was a founding faculty member. He appeared yearly at the "Brubeck Institute" graciously supported by the Selmer Company as a clinician/artist for eleven summers. Bart has also appeared as faculty at the Stanford Summer Jazz Residency on the campus of Stanford University in Palo Alto, California. In recent years the program at Booker T. Washington has garnered international attention by performing at The Monterey Jazz Festival, The World Sax Conference, The International Association of Jazz Educators Conference, The Kennedy Center, The Grammy's, NFAA Arts Recognition and Talent Search, Texas Music Educators Association, The Jazz Educators Network Conference (JEN), for the Queen of England, the Prime Minister of England and the NEA with a performance at the White House for the President of the United States in July of 2004.